In the meantime the relations between the Netherlands and the Republic continued to become worse. The agreement Linggadjati on 25th March had brought a minor relief. It looked like a new era had started but for Semarang the situation continued to be the same. All traffic to the town was stopped and checked and the building of positions continued without delay. The Commander of the Brigade protested against this. Also the signing in Linggadjati was supposed to make the economic situation better. Anyway all this protest was answered with the message that it should be met with countermeasure and everything continued to be the same. In the first week of May at least 100 of the opponent’s positions were counted in the 2-kilometre zone. When the discussions ended in a dead track at the end of May. And the Commissioner General had sent his famous note to the Netherlands and went for consultations with the government. There started to be a noticeable uneasiness on the other side of the demarcation line. In the white days alarm positions were made ready along the whole front at the opponent’s side. While at our side no percussions were made and no one realised that this political crisis could end in military actions. After this day the placing of bombs and mines was intensified together with roadblocks. Shooting exercises that people heard or spoke about was held at a daily basis. The end of June and the rejection to the note and Sjahrir stepping down brought a raise in tension. It appeared that an armed conflict was not to be expected until the American memorandum on 28th June suddenly brought uneasiness on the Dutch side too. The clamorous celebrating of the birthday of H.R.H. Prince Bernhard was the clear proof of this. In the first week of July an agreement was reached with the Republic on every point in the Commissioner Generals note except the important question about the joint police force. Suddenly the politic was standing in the middle of interest when local events made things change from the greatest optimism one day to the blackest despair the next. Outsiders became dizzy from memoranda, notes and aide-memorandum, which then was answered by the Republic with counter notes with the necessary corrections. On Friday evening on the 18th July at 23.00 the Garrison in Semarang got its orders a sign that the situation was getting serious. Saturday brought a lot of trucks, a long line of dispatch riders, meetings and rumours. The following Sunday the silence was obvious in the rooms of the 2-7 R.I. if one looked after. Then in the middle of the day an impressive cortège of men and vehicles departed destination unknown. In the evening Willem Noske performed for the soldiers from 1st R.S. and 2-13 R.I. in the cantina in the camp at Djatingaleh. Everybody listened to this artist who with his acting knew how to touch everyone. A few hours later the action was started. On the 21st at 1.00AM the Commander of the Brigade and his battle staff went to de Gombel. The artillery took up position near the southern part of the demarcation line. The tanks started to crawl through the terrain in the direction of the kampong Tembalang and the whole battalion of the 1st R.S. except the already mentioned Storm Unit went into its start positions in the kampong Srondol like the 27 did in Patemon. At 7.00 in the morning the demarcation line had not yet been crossed and no shoot had sounded. Then 9 minutes later sounded the first volley from the artillery: the action had started. On this first day the goal was very limited: The securing of Oengaran around 14 kilometres from our southern most post. It was planned to move forward in three columns. One along the big road to the south: 1st R.S. a battle group consisting solely of infantry supported by a mine clearing platoon and a few carriers. A minor group consisting of 3rd Escadron Vechtwagens with some infantry in support should move forward in the terrain to the east of the road. 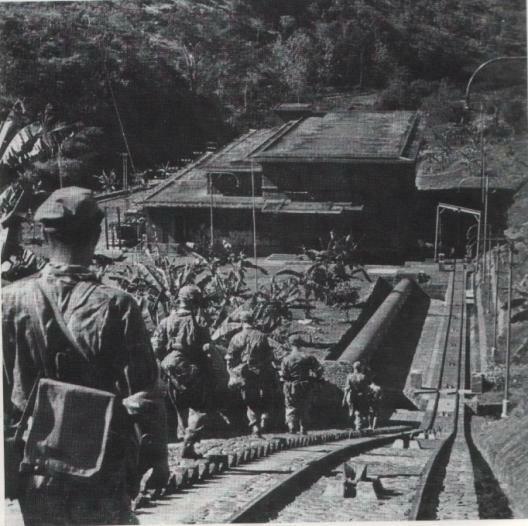 The third column consisting of the battalion 2-7 R.I. moved forward on the other side of the kali Garang on a detour to near Oengaran from the west. This group had carriers too. They quickly went into some unmovable terrain and the vehicles had to be left behind. This advance was made with only minor uneasiness: the men knew how well the opponent had prepared himself the last couple of months. Everybody expected that the terrain had to be seized metre for metre through mines and booby-traps. After the preparing artillery fire in the most marvellous way no opposition was met. But still the advance was very slow: blocks, mines and the uncertainty forced them to move forward very slowly. Until the Commander of the 1st R.S. around 4.00PM in the afternoon passed the main line of resistance and started a forced march on Oengaran with carriers where he arrived nearly without resistance around 5.30PM. The tank column was also taken away from the road since their support in threaten the enemy flank was not necessary. In the meantime the other battalion struggled with the terrain difficulties. The rain that had fallen so plenty the day before had put the time scheme in danger. Dead-beat the Amsterdammer's did not arrive at their destination before the fall of darkness. The troops spend the night in Oengaran in the huts, which were behind repair and filthy and already in the past months had been deserted by their inhabitants. The ruins reminded everyone about the British bombardment in the end of 1945. Some of them of course had to pull guard duty at the entrances to the town: the rest slept a well-deserved sleep and felt happy for the achievements of the day…… without losses. The ones who did not sleep were engineers and drivers who had to make ready for the next day. The 5th Field Engineer Company used a couple of hours during the darkness to remove some in unshakable roadblocks. They were just behind the first troops and they showed apparently no sign of fear and that the terrain hardly was searched and in the light from the lamps were a good target for snipers. They worked as peacefully as if they were working in the middle of Semarang. At 8.00 the first columns of the A.A.T. with supplies could pass Oengaran and during the night the road was made completely clear. By the light of the day we saw Oengaran. It was in itself an event for people who in one and a half year had been looking at this mountain with the chance to close by. It was a sunny morning and the mountain stood there in all its might and colours. But…… it formed no longer the end from there they could see farther into the land where other fantasies made them worry. It gave a feeling of liberty and security that the whole operation had gone as a fairy-like evening trip. We had still not seen anything of India. For the first time we saw kampongs which was in a good condition, chickens and goats who ran along the huts and signs of life and living but no people. We saw rice fields in waving stairs with rustle running water. But we still had not left squatted around in town along the streets in the shadow and cover from the huts. We forgot there was a war going on and that from this day there was fought: it more looked like a great picnic trip. Then the Storm Unit rolled into the village. In front Humber’s and Scout cars from Paw 2 then and in between the armed vehicles with the storm company from the 1st R.S. This morning they had left Semarang and came driving. Outside the town they had found the first flowers: in Semarang there were no flowers even our dead were honoured with paper. Now they were hanging from the vehicles: It looked like a flower corso. Then came the whole of the battalion 2-13, which it was planned should secure Toentang and Bringin and the bridges and the central, which the Storm Unit hoped to capture undisturbed in a quick push. At the tail was a company from 3-7, which task it, was to occupy the central. Then the 1st R.S. should follow and secure Ambarawa. The menu for the day was: to push through in southern direction to Bawen (16 kilometres south from Oengaran) where there was a bifurcation. One way went to Toentang, Salatiga (13 kilometres) and the other to Ambarawa (4 kilometres). The first mentioned road was the way to Solo and the other to Magelang, Djokjakarta. But we did not look at it that way. Toentang and Ambarawa were the objects. Beside this a recognisance push against Salatiga for the Storm Unit was on the program. It was already in the middle of the day when the column started to move out. Although the road posses several places, which where ideal for ambushes no serious opposition was met. The bridges were mined with fly bombs but the men who were supposed to bring them to explosion fled when our armed vehicles were nearing. In a slow speed they moved forward along the big road. Everywhere there was a deadly silence. The population did not show up and the enemy even less. In this way we drove – everyone was motorised – along the side of Oengaran and in Bawen we got the cheering information that the Storm Unit had captured the big bridge over the kali Toentang. The men who should bring the bridge to explosion (nine fly bombs) were surprised and put out of action in time. The infantry drove over the seized bridge and surroundings and the company from 3-7 took the road to Djelok to capture the big central, the power station for all Mid-Java. And it succeeded. The central was completely mined but the platoon that had the task to bring it to explosion fled before doing it. The workers were mostly the same as before and waited on the Dutch with the keys and modest administration. Another part of 2-13 R.I. moved against Ambarawa. Here no opposition was met either. The town was in practically deserted. The inhabitants had fled following the example of the T.N.I: a train at the station, which was under steam, was hold back in time. At the hospital the doctors from 31st Hupva went into work right away to help some Indonesians since their own doctors had fled during their operations. The passar had been left in a rush: all kind of fruit (do not forget the tomatoes) lay everywhere beside eggs together with other goodies, which it was impossible to count afterwards. Unlike the inhabitants who were counted to 500. There was no time for this. The advance was continued without hesitation in the direction of Bodeno, which made a good tactical point, which dominated the valley in, which Ambarawa was laying. Here a company from 2-13 was strengthen by A 1 Veld during the night until Ambarawa, which was now behind the front was secured by 1st R.S. In the meantime the Storm Unit had pushed forward in the direction of Salatiga 10 kilometres on the other side of the Toentang Bridge. This detachment met no opposition either, which was very surprising. At the crossroad Toentangse road, Solose road and Bringinse road in Salatiga they saw T.N.I. soldiers for the first time. They were sunbathing in front of Hotel Kalimantan the Headquarter of the Commandant of the Semarang Front. A single salvo was enough to make them run in every direction. After this task the armed unit returned. If the orders had sounded otherwise it would have been easy to push through even to Solo without much trouble! Later it was found out that the road was not blocked and this quick advance had not been expected. Although the danger from our troops was gone for the time being the T.N.I. decided to evacuate the town. Before doing so they forced the Chinese population (around 3000) out of their homes. The homes were then destroyed completely after this “operation” following the receipt “sudah dirampok” from “kosang ”. The inhabitants themselves were driven in the direction of Solo; from where it was planned they should continue the following day. The official looting gangs of course gave other elements a free hand to do the same. While the military occupants went away with the prisoners. The looting of the Chinese homes continued – all of these homes – and then they were set on fire. In the evening the red blaze hang over the town where it was seen from Toentang. It was then reported that the whole road to Solo was burning. To prevent further disorder the Commander of the T-Brigade decided to seize the town. During the night 1st R.S. was taken out of Ambarawa and released by 2-7. The battalion moved to Salatiga, which was seized peacefully. The town centre had been burnt down rioters was still running around in the ruins but quick reactions made a quick end to this. In this way the Tigers had secured the flank of Rawa Pening and the entrance to Solo and Magelang in the early morning of 23rd July. The mood was excellent. All preparations seemed to have gone well in practise. The supplies arrived without delay thanks to the two A.A.T. companies: 17th, which had been part of the Brigade all the time and 32nd, which had arrived in Semarang on 10th July. The locations of the troops were as follows: 1st R.S. in Salatiga together with the 2nd Afdeling Veld 2 R.V.A , which had been transferred from the 7th December Division to the Brigade on 6th June. To strengthen the Brigade Artillery, which was far from enough. And during the police action it formed the mobile unit instead of A 1 Veld, which went into position. The 2-13 was in Bringin and Toentang, 2-7 and a battery from A 1 Veld in Ambarawa. In Oengaran was part of 3-7 and 2-9 was still to find in its old positions at the west front of Semarang. One must remember that a counterattack by the opponent on Semarang still was to be expected. Beside this the 2-6 together with the rest of the 3-7 and the 5th Guard battalion consisting of young native soldiers from the citizen conscripts (it could celebrate its one year of existence on 8th August) and the 4th Battalion from the Princess Irene Brigade, which had arrived 14 days before made up the tough east front. It was also on this front the first possibilities should show up. 2 Amsterdammer’s nickname for 2-7 R.I.